Dubai, UAE, October 11, 2018: The world's favourite jeweller, Joyalukkas, is geared up to celebrate this year's Diwali with offers like never before. All Joyalukkas showrooms across the world have been adorned with the latest collection of jewellery and the staff is being prepared to handle the festive rush. The celebration of success is passed on to their patrons with irresistible offers. This year, Joyalukkas is delighting its customers with more than one offer to celebrate. The grand prize includes winning up to 1000 Gold Bars through a Raffle draw. Apart from the Raffle Coupon, customers will also get a 10% Cash Back voucher on purchase of diamond and polki jewellery. 0% deduction on gold exchange and securing the gold price fluctuations by paying 10% in advance are the other offers customers can avail. Apart from the offers, customers can also look forward to an all-new range of festive collection jewellery at every branch of Joyalukkas. 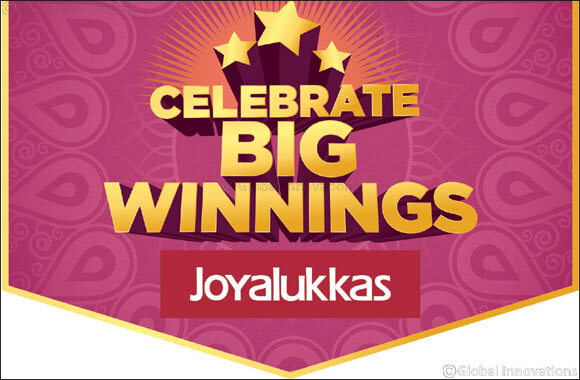 The Joyalukkas Celebrate Big Winnings promotion is applicable to all Joyalukkas outlets.